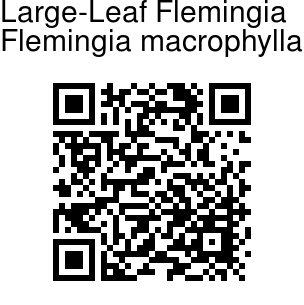 Large-Leaf Flemingia is a woody, perennial, deep-rooting, and leafy shrub. It is about 0.6-2.5 m tall. The main stem is prostrate or erect, with numerous stems arising from a single base. The young branches are greenish, ribbed, triangular in section and silky; while the old stems are brown, almost round in section. The leaves are trifoliate. Leaflets are papery, with a hairless upper surface. 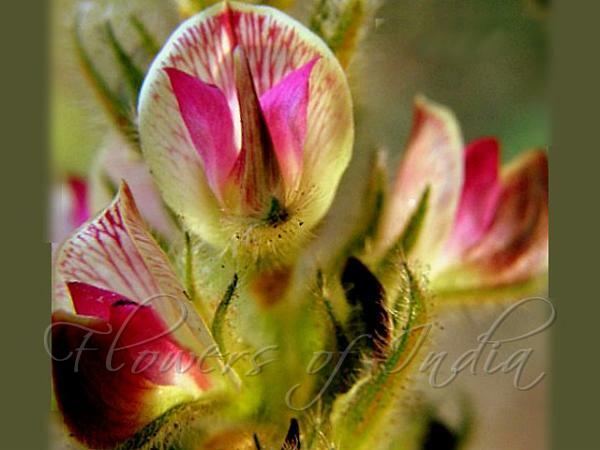 Flowers are borne in mostly dense racemes, in leaf-axils, 5-30 cm long, with 15-40 pea-like flowers. Calyx is 7-13 mm long; flowers 1.4 cm long, white to pink or yellowish, densely silky, standard greenish with distinct red blotches or stripes and purple tip, wings rose-pink. Pods are small and turn brown when ripening; they split open, generally with two shiny black seeds in the vessel. Seeds are globular, 2-3 mm in diameter, and shiny black. The leaves are disproportionately large, hence origin of the specific name, macrophylla. Large-Leaf Flemingia is found in Southeast Asia, southern China, Taiwan, India and Sri Lanka. Identification credit: Abid Munshi Photographed in Nelliyampathy, Kerala.